Nearly a quarter of damages caused by natural disasters in the developing world are borne by the agriculture sector, according to preliminary findings of a new study of the Food and Agricultural Organization (FAO). The findings, released at the UN World Conference on Disaster Risk Reduction, say more than 22 per cent of the damages caused by natural hazards—such as drought, floods, storms or tsunamis—are accounted for by the agriculture sector. According to study, during drought period, agriculture absorbs up to 84 percent of all economic impacts. 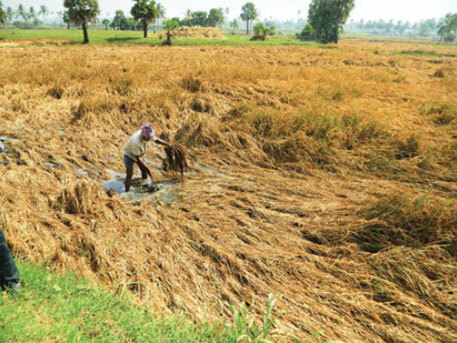 Within the agricultural sector, 42 per cent of assessed losses were that of crops. These damages and losses are often incurred by poor rural and semi-rural communities without insurance and lacking the financial resources needed to regain lost livelihoods. Yet only 4.5 percent of post-disaster humanitarian aid in the 2003-2013 period targeted agriculture, the findings point out. The study is based on reported damages in 78 post-disaster risk assessments in 48 countries between 2003 and 2013. The total damages reported for all economic sectors from natural disasters were assessed at $140 billion. Out of this, damage worth $30 billion was faced by agriculture, which consists of crops, livestock, forestry, and fisheries. Livestock is the second most affected subsector after crops, accounting for 36 per cent of all damage and losses, at a total of $11 billion between 2003 and 2013. According to the study, within the agricultural sector, 42 per cent of assessed losses were to crops ($13 billion) - with floods being the main culprit, responsible for 60 per cent of crop damages, followed by storms (23 per cent of crop damages). The study also assessed that minimum damage was to the forestry sector. According to study, out of the 78 disasters assessed, 45 involved impacts to the fisheries subsector ($1.7 billion, or 6 per cent all damages born by the agricultural sector). The maximum damage—70 per cent—was caused by tsunamis, typically infrequent events. Storms such as hurricanes and typhoons account for roughly 16 per cent of the economic impact on fisheries, followed by floods (10 per cent). The forestry sector incurred $737 million in damages and losses, representing 2.4 percent of the total for the agricultural sector. "Agriculture and all that it encompasses is not only critical for our food supply, it also remains a main source of livelihoods across the planet. While it is a sector at risk, agriculture also can be the foundation upon which we build societies that are more resilient and better equipped to deal with disasters," said FAO Director-General José Graziano da Silva. "This is why building resilience of livelihoods to threats and crises is one of FAO's top priorities," he added. But then FAO's 22 per cent figure represents only damages reported via post-disaster risk assessments, so while indicative of scale, the actual impact is likely to be even higher, says FAO. To arrive at a closer estimate of the true financial cost of disasters to developing world agriculture, FAO compared decreases in yields during and after disasters with yield trends in 67 countries affected by (at least one) medium- to larger-scale events between 2003 and 2013. The final tally was $70 billion in damages to crops and livestock over that 10 year period, says FAO’s press release. The press release of FAO also announced the launch of a special facility aimed at helping countries better equip their food production sectors to reduce risk exposure, limit impacts, and be better prepared to cope with disasters. Asia was the most affected region, with estimated losses adding up to $28 billion, followed by Africa at $26 billion. Though it is not new but the fact is that NDA government decided to stop buying the grain from the farming community under levy which goes against the food security. NDA government is going against common man's interests in all sectors -- no price control and thus help businessmen.